Lichen, with orange apothecia, growing on vertical limestone face. Thin, grey crustose thallus. Whitish rims of young apothecia appear split radially. 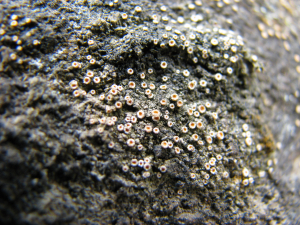 Older apothecia contain concave orange discs surrounded by whitish rims that are bumpy on their outer curved edges. Possibly Gyalecta jenensis.